As with other testamentary instruments, such as a will, trusts give clear directions on how to distribute property upon the happening of a specified event, for example, death. Trusts can also protect assets from creditors, depending on the type of trust you use. This occurs because property held in a trust is considered property of the trust. In other words, once you place property in the trust it is no longer yours; it belongs to the trust. Some limitations exist, however. For example, few states allow trusts for the sole purpose of asset protection. A basic understanding of trusts can help you determine the best type of trust to use in order to protect your assets. 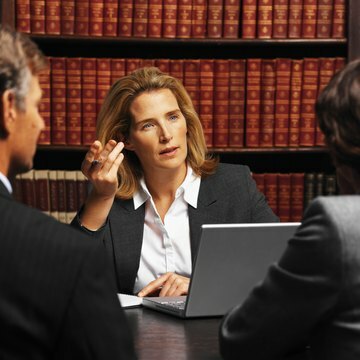 Speak to a lawyer or consult an online legal document provider to help you construct your trust document. Trust laws vary by state. A lawyer licensed in your state can navigate through all pertinent laws and ensure you create a legally enforceable trust. Enter the assets that need protection into the trust. This may include assets such as cars, stocks and bank accounts. Any assets you enter into the trust become property of the trust and are no longer yours. Name beneficiaries of the trust. These individuals will receive trust property upon the happening of a specific event. Common events include the death of the settlor, the person who creates the trust, or a beneficiary's arrival at a certain age. Only a few states allow a settlor to also be the beneficiary of a trust since this violates public policy because it is a strong indication that the trust was created for the sole purpose of evading creditors. These types of trusts are commonly referred to as domestic asset protection trusts, or "DAPT trusts." If you'd like to establish a DAPT, first consult with an online legal document provider or attorney to determine whether your state allows them. Name a trustee to control and manage the trust. These responsibilities includes such things as paying off debts and ensuring none of the trust property devalues. The settlor can outline any specific directions for the trustee to follow as well. Finalize the trust document to ensure it becomes legally operative. Once the trust is complete, the assets officially become part of the trust and are fully protected from creditors. Again, it's important to note that full protection only occurs if you follow all pertinent state laws. If not, the trust can fail; thereby, leaving assets susceptible to creditors. If you want to shield investments and property from creditors, or anyone who might have a claim on them, an asset protection trust provides a viable option. A trust is a legal structure that owns assets under a separate name and is under the control of a trustee. Claimants to the assets will still have access unless the creator of the trust, known as the grantor, does some careful advance planning when establishing the trust. Last wills and trusts are two ways to distribute your property after you die. A will and a trust may be used together or separately. Even if you set up your own will or trust, you may wish to consult an attorney to ensure your will or trust meets your state's laws and that you have not overlooked anything.